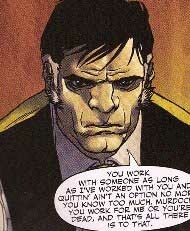 In the 2003 live-action feature film Daredevil, which details the origin of the hero, "the Fixer" (Roscoe Sweeney) was not named as Jack Murdock's employer. A mob boss named "Fallon" was used instead. However, "Fallon" and Sweeney are both referred to as the Fixer, and their roles are essentially identical. We are listing Fallon and Sweeney as the same character in this database.